Many people are sitting in their nice warm homes at this time of year thinking about Thanksgiving and Christmas, drinking their favorite warm beverage and maybe a cookie or two. But for us here at Allred's Outback & More, we are thinking of ways to make your spring time a more enjoyable time, with comfortable outdoor furniture, raised gardens with flowers, tomatoes, peas, carrots, radishes, beets, strawberries and other items that you love, growing in a weed-free environment, raised higher to relieve your aching back when you garden. Just think about it, needing to only bend over slightly to pluck a carrot from the ground, to be able to see the tomatoes at eye level and pick the reddest, ripest, fresh tomato that you have ever eaten. Garden furniture that is so comfortable that you won't want to leave it to pick your ripe tomato. Tables and gliders so inviting that your friends and family will stay longer when they visit you. 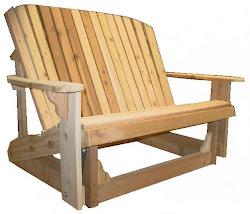 That old Adirondack style of furniture that is very American and loved by millions could be yours, on your porch, lawn or garden, giving it style and pizazz. We have it all, Raised Gardens and Great Furniture, see our lists and order right away.